Ibanez has a new tube amp for guitar that deserves a second look, and a third, and a fourth. The latest amp in the Ibanez Tube Screamer amp series, known as the TSA5TVR model, is a gorgeous vintage styled combo amp that is priced competitively. But first, how does it sound and operate? The Ibanez Tube Screamer TSA5TVR is an all tube 5 watt affair with a specially voiced Jensen 8 inch speaker. 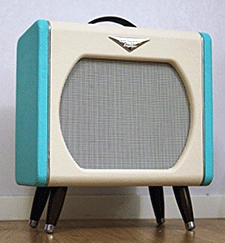 If you like classic Fender 6V6 tones, especially “tweed” era tones, this little amp is right up your alley. 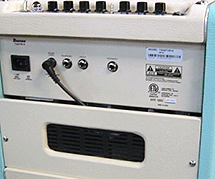 The preamp is powered by a 12AX7 and the power amp is powered by a 6V6GT. The TSA5TVR comes stock with Ruby tubes. 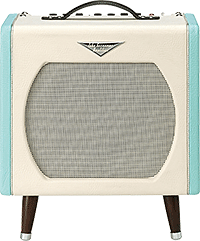 At just 8 inches, the Jensen speaker is not going to break windows, but it is well designed for this amp and does not sound strained or shrill even at maximum volume. The 6V6GT tube puts out 5 glorious watts of tube power and there is an easy connection on the back to power a larger cabinet if you prefer. Despite its size, the TSA5TVR fills a room well and sounds much bigger than it looks. The tone circuit on the TSA5TVR, which is controlled with treble and bass knobs, is a little different. The treble control sounds more like it deemphasizes or filters midrange and bass, as opposed to just increasing the high end. In conjunction with the bass knob, the tone controls on the TSA5TVR provide excellent adjustment range. Even though it is priced very aggressively, the TSA5TVR comes standard with a real honest-to-goodness mechanical spring tank. That’s right, real reverb on tap, and nothing digital about it. If you are looking for expansive atmospheric reverb or the range of depth that an outboard tank can provide for a genre like surf or spy music (such as a Fender ’63 Tube Reverb Reissue Unit) then the TSA5TVR‘s accutronics spring reverb might not get you there, but it’s great for most anything else. And just like the other amps in the Ibanez Tube Screamer amp lineup, the TSA5TVR has a classic 3 knob Tube Screamer circuit baked right into the front end of the amp in place of a conventional gain or pre-gain control. And if you are not a Tube Screamer fan, don’t worry, because keeping the distortion knob set very low on the Tube Screamer, and simply working the tone and level knobs is more than adequate to provide conventional overdrive and pre-gain duties for this amp. If anything, it is more versatile with the Tube Screamer circuit baked in, even if you are not a Tube Screamer fan. 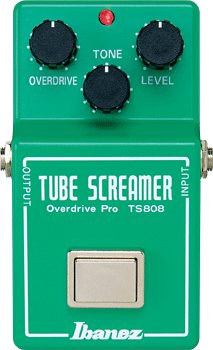 And if you are a Tube Screamer fan, you won’t be disappointed. Comparing to an external Ibanez TS808 pedal, the built-in Tube Screamer on the TSA5TVR is just as good, providing exactly matched tones to my ears, no batteries required. And an optional footswitch is available for the TSA5TVR to engage/disenage the Tube Screamer. The TSA5TVR sounds so good, that I would compare the tone to actual vintage Fender tweeds, Fender re-issues, and some wonderful boutique tube amps from the likes of Carr and Swart built around 6V6 power tubes. And the TSA5TVR includes a dedicated line out (with cabinet emulation) and a dedicated headphone out, so it’s a pretty amazing amp considering the TSA5TVR‘s relatively low price. Pedals through the Ibanez TSA5TVR sound great and make the amp very versatile. Just keep in mind that if you engage the Tube Screamer circuit in the amp that is going to become akin to the last pedal in your signal path. Other overdrive pedals driving the amp set clean sounded great, as did distortion and delay pedals for example. In terms of looks, if you couldn’t tell from the photos above, the TSA5TVR looks spectacular with a retro fit and finish that I think will please most players who appreciate the visual design of vintage gear. It even comes with some 1950s style TV legs. I don’t want to overstate the comparison between the TSA5TVR and some amps from the likes of Carr and Swart that are hand-built, but I have to put the TSA5TVR in that ballpark, both visually and tone-wise. I think the Ibanez TSA5TVR is a fantastic tube amp and I think it may even become a valuable and collectible amp. Highly recommended. And finally, since I wrote such a glowing review of the Blackstar HT1R recently, you may be wondering how it compares with the Ibanez TSA5TVR since they both have an 8 inch speaker. Both amps are outstanding. Being a 1 watt amp, the Blackstar HT1R is not as loud. Both amps have headphone and emulated out, but only the Blackstar HT1R has a line in jack for MP3, etc. I think the bottom line is that if you need more volume, go with the Ibanez TSA5TVR. But, if you want Marshall-like tones, definitely go with the Blackstar HT1R. And if you want authentic Fender tweed-like tones, definitely go with the Ibanez TSA5TVR.